Welcome to the latest installment of our ‘Interview with a Student’ series. Chris is a long time student with Urban Escrima Self Defence so we are really pleased to see what Chris’s thoughts are on training. How long have you been training with Urban Escrima and what grade are you? I started training with Urban Escrima in May 2011 and I am second grade. What if any martial arts have you done before? I have done Jiu Jitsu and Aikido before starting Escrima. What attracted you to train in Escrima Concepts? I like the simplicity and no nonsense approach. 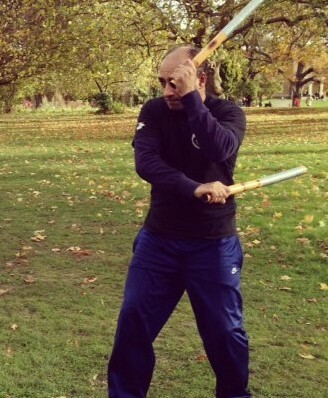 The Escrima which is taught is pretty dynamic and flexible. It welcomes techniques from any martial arts that works, so what I have learnt before is not wasted. I would say what I have learnt before is the rough edges being chiselled, refined + learning something new. What things do you most enjoy training at Urban Escrima? Its a really challenging. Most of the time I am trying to overcome myself before learning to overcome or control others if there is a scrap. But I think mentally the weapons part has taught me to keep/walk away from trouble because of the damage it can do if employed. What do you feel is the most important thing you have learned at Urban Escrima? Finding out how little I know about self defence in stress situations and believe me in a confrontation the situation will be stressful. No getting away from that. What would you say to someone thinking of coming down to train at Urban Escrima? I would say come and try out the system for about a month and you will train with some great lads and lasses. 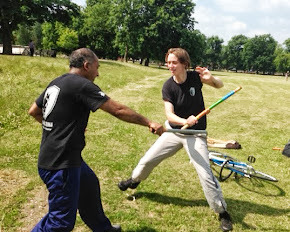 "Escrima Concepts is a realistic and effective self defence system, which is fun, increases awareness and builds confidence. Learn self defence in London. Come and train with Urban Escrima"
Don't Fear Change. Constantly Evolve! Contact Us: Start Training Today!